Kick off your visit on the 9th (Tue): discover the deep blue sea with a scuba or snorkeling tour. To see reviews, maps, traveler tips, and more tourist information, go to the Port Douglas trip itinerary builder website . Bengaluru, India to Port Douglas is an approximately 19-hour combination of flight and shuttle. You can also do a combination of flight, car, and ferry. Traveling from Bengaluru to Port Douglas, you'll lose 4 hours due to the time zone difference. Plan for a bit cooler temperatures traveling from Bengaluru in July, with highs in Port Douglas at 30°C and lows at 20°C. Finish your sightseeing early on the 9th (Tue) to allow enough time to travel to Sydney. 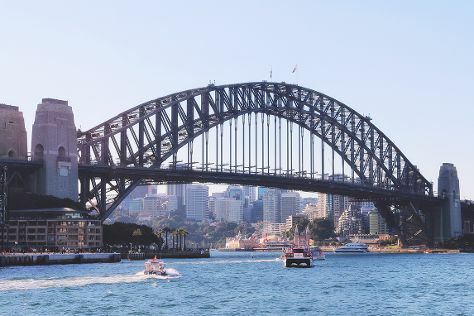 Start off your visit on the 10th (Wed): admire the natural beauty at Royal Botanic Garden Sydney, catch a live performance at Sydney Opera House, then don't miss a visit to Sydney Harbour Bridge, and finally take a stroll through The Rocks. On the 11th (Thu), you'll have a packed day of sightseeing: kick back and relax at Bondi Beach, then admire nature's wide array of creatures at Sea Life Sydney Aquarium, and then wander the streets of Darling Harbour. For reviews, more things to do, ratings, and tourist information, go to the Sydney journey planning site . Do a combination of shuttle and flight from Port Douglas to Sydney in 7 hours. Alternatively, you can drive; or do a combination of bus and train. In July, Sydney is slightly colder than Port Douglas - with highs of 21°C and lows of 9°C. On the 12th (Fri), you'll have the morning to explore before heading back home.